in and around Maggie Valley! Featuring the world-renowned banjo picker: "The Legendary Raymond Fairchild"
Preserving the mountain culture and keeping mountain heritage alive through the music of Appalachia - Bluegrass, America's music. The "Clogging Capital of the World" features some of the area's best mountain clog teams. Clogging & Square Dancing classes, too! Six courses within 20 minutes of Timberwolf Creek! And we can arrange for you to borrow clubs. Mountain golf is played in the highlands of Haywood County. Here, lush rolling fairways are surrounded by endless mountain vistas, and spectacular scenery greets you around every dogleg. It's like no other game you've ever played, in an area unlike any other. Discover just how great a mountain golf vacation can be. Beautiful, large bent grass greens are the finest in the area. The fairways are cool weather rye and blue grasses and remain green all year long. 18 hole, par 72 championship course. This 18 hole, par 68 course offers views of the 200 acre lake and the surrounding mountains. Scenic mountain golf resort, tree-lined, lush rolling fairways, bent grass greens, streams, ponds and spectacular views. 27 holes, par 70. One of North Carolina's most scenic courses. 6,812 yards lead you through mountain fairways and scenic valleys. Test your skills on the 429-yard uphill par 4 with a dogleg right and a mountain stream that runs from tee to green. 18 hole, par 72. 18-hole, par 70 regulation golf course. Scratch golfers and hackers alike find the tight course and winding creeks a real challenge. 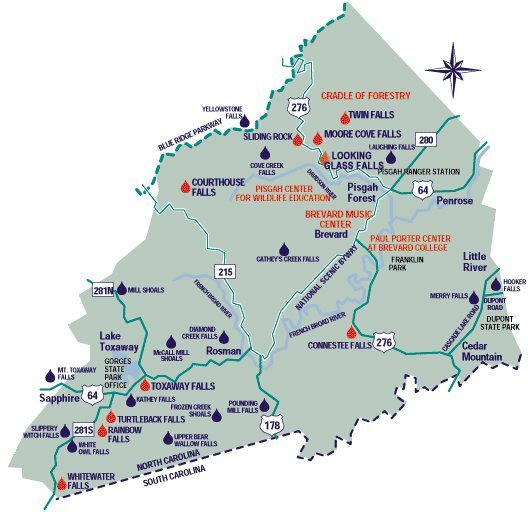 The entrance to the Blue Ridge Parkway is less than four miles from your door at Timberwolf Creek! The Parkway actually begins in Cherokee, with Soco Gap (that's us) being the first exit. After a day playing in Cherokee, come home via the Blue Ridge Parkway and be sure to stop for the sunset! Although the reservation is less than five miles away from Timberwolf Creek, the town of Cherokee is approximately ten. Harrah's Casino is there. Allow at least a half an hour to maneuver the winding mountain roads over Soco Gap! An outstanding introduction to the culture and heritage of the Cherokee. Live Open-Air theater production by the Cherokee. During June, July and August only. Do check the schedule! An authentic replica of an 18th century Cherokee community. Cherokee guides explain the history, culture and life-style of their ancestors. Watch Cherokee artisans demonstrate their arts and crafts. You'll also enjoy the replica of a 7-sided Council House and typical Cherokee homes as they were 250 years ago. Located between the Blue Ridge Parkway and the Great Smoky Mountains, along the streams of the Shining Rock Wilderness area in Haywood County, learn fly tying, how to 'read the water', and enjoy a full day of instruction and fishing on stocked private streams. A fishing license for the Park is $20 for the year. On the Cherokee reservation, you don't need a license, just a $5 daily permit. We have local mines which do not "salt" their findings, so that all gems are natural and occur within the mine. Some mines do "salt" and that's great when you've got little ones and you want a sure thing to give them a thrill. The largest star sapphire ever mined was found right here in Haywood County! 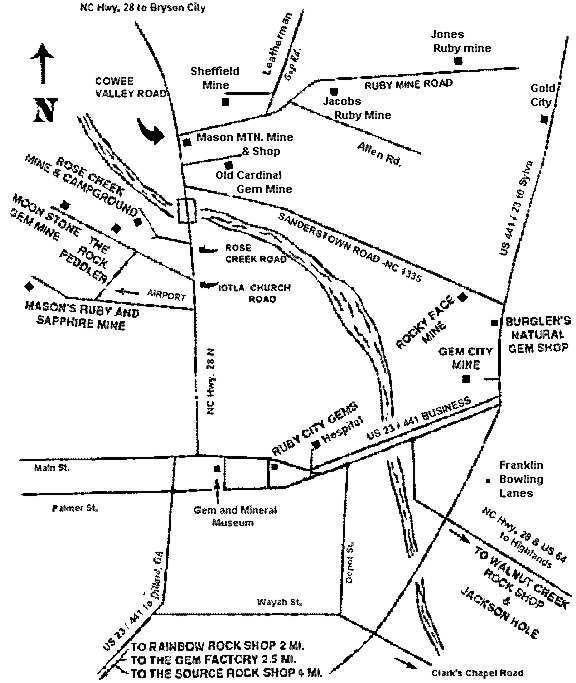 The most famous mine in the area. Flume for sapphires and other gems. The world's largest blue star sapphires were discovered here-- including the Star of Carolina! Open year-round, and an easy drive from Timberwolf Creek. Your innkeepers at Timberwolf Creek love to hike... well, ok, we're more into strolling... but that doesn't mean that we don't know where the great hiking trails are! Want to wander through the primeval forest along Deep Creek (on a well-maintained path), or do you prefer something more challenging, say, like Boogerman Trail? We'll be happy to give you directions and help you pack a lunch! And a word to the wise! There are a number of stables right here in Haywood County. All cater to beginners as well as experienced riders. We can arrange for you to have an hour-long trip right up into the Great Smokey Mountain National Park, or even a dinner ride. Four hour trips with BBQ. Two hour and all-day rides available for adults and children over six. Experienced wranglers accompany all trips. Ride the Great Smoky Mountains National Park! Hourly and day rides. Trips to the Great Smoky Mountains National Park. 1 hour and 1 3/4 hour rides that climb up to 1,000 feet. 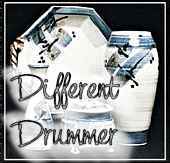 Maggie Valley's own potter, Terry will WOW you with his fabulous work. That's a little sample of his pottery in the photo. Want to see more? His studio is on the main road in Maggie Valley - a little log cabin, across from Eaglenest. And check it out: he does entire landscapes in clay! Popcorn Sutton who is featured prominently in both Mountain Talk and in the CMT (Country Music Television) production Moonshine Madness. Henry Queen who is also featured in Mountain Talk, is a wonderfully talented musician. You may hear his music playing here at Timberwolf Creek, and you can check it out yourself at his website. Raymond Fairchild who plays his banjo nightly at the Maggie Valley Opry House. Hattie Caldwell Davis is our neighbor across the lane, and author of several books outlining the history of this beautiful place. And over in Asheville, New Morning Gallery carries Todd Barrow's work - he's the fellow who made the beautiful bed in The Woodland room in our Black Bear Cottage in the Woods. He was also featured on HGTV's Modern Masters series, and he made the bedroom furniture for the Swiss Family Robinson Treehouse at Walt Disney World, too! The entrance to the Cataloochee Ski Resort is just over a mile from Timberwolf Creek! Of course, then you drive four miles ...UP... to the ski lifts! Take advantage of their midweek rates, and be sure to check out the schedule for the Night Skis. Equipment rentals are available both in Maggie, and at the resort. Have you tried snowboarding yet? We've heard good reports of the private lessons (very reasonable) as well. Lift Tickets range from $31 Weekday to $51 Holiday for full day tickets. Half Days, Twilight, and Night Skiing Lift Tickets start at $22. Military & Student rates are discounted - Folks over 65 ski free! Sit back and enjoy the tow to the top, and then get ready for the slide of your life. Here at Timberwolf Creek we have a collection of guidebooks to waterfalls, with photos of nearby falls, and directions to them. From serious hikes to leisurely drives, there's something for everyone. We're happy to loan you a guidebook during your stay. The rivers of Western North Carolina offer a variety of raft trips, including the hair-raising Ocoee (experienced rafters only), the French Broad which has enough rapids to give the novice a thrill, and the Nantahala for family trips. Take your river trip via raft, canoe, kayak, or "duck". Our family started out on the French Broad River and we can recommend this run, especially since it ends at Hot Springs... There's nothing like climbing into a big steaming hot tub right at the edge of the river to ease the muscles you just discovered you had! Last year's trip on the Little Pigeon River was a bit more challenging, and a lot of fun! A great couple of hours on the river, it starts about on the other side of the Great Smoky Mountains National Park, so it becomes a fabulous day-trip. The drive through the park takes about an hour and a half. Then you spend the early afternoon on the river, leaving the rest of your day free to picnic, or seek out some great Carolina barbeque, or hike a mountain trail. We chose to drive across the "top" of North Carolina, and -after a brief sojourn back in those great mineral springs tubs at Hot Springs- made our way back to Timberwolf Creek via Asheville. National Park, whitewater, hot springs soaking, and shopping. What more could you ask? Steam or diesel engines pull these trains along the Nantahala River Gorge, and more. Offering a special Gourmet Dinner Train ride most Friday and Saturday evenings; also Mystery Theater and Wines of the World dinner trains. The Raft-n-Rail package includes a train ride along the river and then a raft ride back! Built in 1875 and is listed on the National Register of Historic Places, the Shelton House features comprehensive exhibits of 19th Century crafts and furniture, as well as a fine collection of Native American artifacts. Craftsmen who have participated in the North Carolina Village of Yesterday fair have a selection of crafts displayed. The collection includes hand-woven coverlets and quilts, sculpture, porcelain, dulcimers, and masterpieces of pottery work. "A living museum with exhibits detailing the history of managed forestry and local craftspeople demonstrating the skills that early mountaineers used to carve their homesteads out of the forest." An international folk dancing festival, held annually right here in Maggie Valley. Choose from several mini-golf courses in the area, including one with a waterfall!